The United States Army had returned to Fort Norfolk by January 1796 with a detachment of the First Regiment of Artillerists and Engineers commanded by Sergeant Robert Hedges. By April 1796 Cadet James Triplett had taken command of Fort Norfolk. Then by October 1796 Lieutenant John Saunders was in command at Fort Norfolk. “Your letter dated the 10th instant I have just received by which I observe that there has been a detachment ordered from West Point, for this place. I shall make it my sole attention to have the Barracks in good order for their reception. On 19 December 1796, Cadet James Triplett was promoted to Lieutenant. By January 1797 Captain Richard Scott Blackburn had taken commander of Fort Norfolk. On March 27, 1797, the day he accepted his appointment, David Patterson, Surgeon's Mate in the Corps of Artillerists and Engineers was stationed at Fort Norfolk, Virginia. On June 13, 1797 money was sent from the Treasurer of the U. S. to pay Private Joseph Kelly, and bounty due to Private John Scott. On July 19, 1797 certifications of pay were made for Cadets Peter Lamkin and Thomas Blackburn, who were also at Fort Norfolk, and the bounty due Pvts. Timothy Merrills, Henry Kent, and Peter Johnson. In June 1797, 3 recruits Charles Spalding, William Hughes, and Isaac Smith were stationed at the Fort. 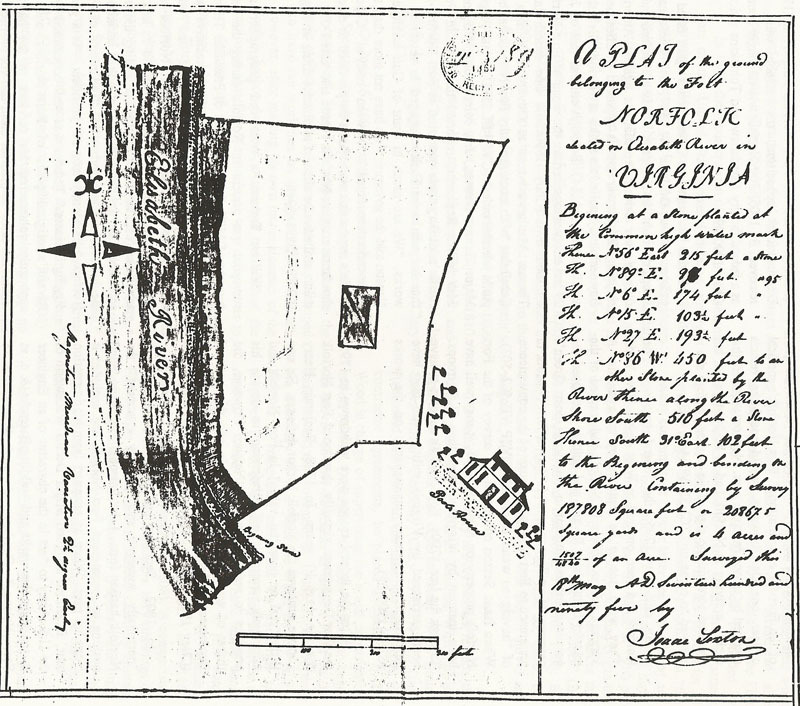 In 1798, Benjamin Henry Latrobe surveyed the Norfolk harbor defenses. He saw little "real or potential value" in Fort Norfolk and effectively wrote it off, preferring to devote his energies to redesigning Fort Nelson. However, the threat of war lessened once again and the work of implementing Latrobe's plan of Fort Nelson lagged (Clary 1990:28). “… such a picture of destruction, I never saw at any post, when I took the Command—and in endeavouring to remedy it I have affronted the late Commanding Officer, who was Capt Blackburn 2 (who knows nothing about Military Matters and never will, as he says himself, he only serves for the lo[a]ves and Fishes) in such a manner, that I was reduced, either to give up my Command, or Arrest him, the former, did not at present suite me—& I was necessitated to do the latter. If I hold my Commission, on the tenour, that he, and some other Virginians, pretend to hold up, It’s good for nothing, and as such I shall consider it, & he will stay, & I’ll return to some more peacefull employ.” Mahlon Ford, a resident of New Jersey and a veteran of the American Revolution, was a major in the First Regiment of Artillerists and Engineers. Because of illness Ford had not reported for duty at his headquarters at Norfolk until September, 1799. In June 1800 Capt. Blackburn and Lieut. Tripplett were court martialed. Lieutenant John Saunders was not court martialed and remained at Fort Norfolk. In 1800 Lieutenant John Saunders was living at 87 Main Street (East) in Norfolk. On 30 April 1803 John Saunders was promoted to Captain. By 1 January, 1805, Captain John Saunders along with 1st Lieutenant Addison B. Armistead and 2nd Lieutenant John Livingston were stationed at Fort Nelson. In 1805, Captain John Saunders was the commander of Fort Nelson. On 9 Jan 1809 John Saunders was promoted to Major in the United States Light Artillery. John Saunders died March 15, 1810 in Fort Nelson. Papers of the War Department: 1784 - 1800 : A project of the Roy Rosenzweig Center for History and New Media, George Mason University with funding from the National Historical Publications and Records Commission and the National Endowment for the Humanities.